Egyptian President Abdel Fattah Al-Sisi tells CBS his country has "a wide range of cooperation" with Israel. Egyptian President Abdel Fattah Al-Sisi is confirming that his military is working with Israel against terrorists in North Sinai. Sisi made the comments in an interview with CBS’ “60 Minutes”, which will air in full on Sunday and of which excerpts were released on Thursday. Asked if this cooperation with Israel was the closest ever between the two countries, he responded, "That is correct…We have a wide range of cooperation with the Israelis." Egypt has been fighting an insurgency in the Sinai Peninsula for several years. Most of the attacks in the region during this time period have been claimed by the Sinai Province, Egypt's Islamic State (ISIS) affiliate. In February, Egypt launched operation “Sinai 2018” in an effort to rid the Sinai Peninsula of Islamic terrorists. The peace treaty signed between Egypt and Israel in 1979 imposed strict limitations on Egyptian deployment in the Sinai, and any Egyptian incursion in the Sinai requires coordination with Israel. In recent years Israel has notably permitted the Egyptian military to boost its presence in the peninsula several times as it fights the insurgency by the local ISIS affiliate. Last year, The New York Times reported that Israel has launched air strikes against ISIS targets in northern Sinai with Egyptian approval. The report, which cited US and British sources, claimed Israeli aircraft attacked targets in Egypt's Sinai Peninsula over 100 times in two years. Egypt’s military spokesperson later vehemently denied the report, insisting it was not “credible” and adding that the Egyptian army is the sole entity that is conducting military operations in co-operation with local police forces in certain areas in North Sinai. Although Egypt became the first Arab country to sign a peace treaty with Israel in 1979, their ties have been formally cold at times, and Egypt's political elite has remained hostile to any normalization of ties with Israel. Ties appear to have improved under Sisi, who took power in 2013 after the army ousted Islamist President Mohammed Morsi of the Muslim Brotherhood. 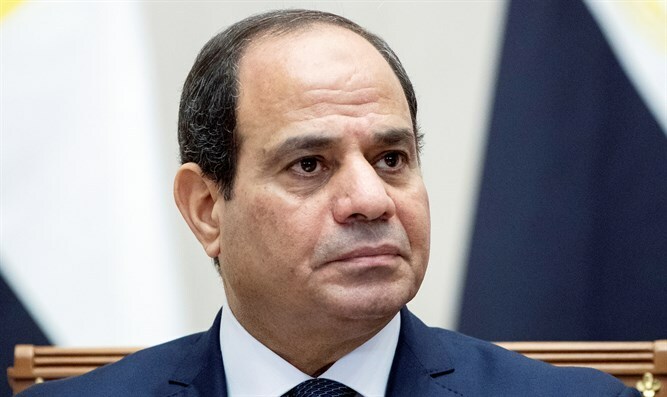 Sisi has in the past urged Israelis and Palestinian Arabs to seize what he said was a "real opportunity" for peace and hailed his own country's peace deal with Israel. He repeated his call for a resumption of peace talks between Israel and the PA last September.